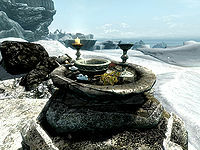 The dagger's owner is one of the missing apprentices from the College of Winterhold. After going off on a private expedition to try to create a spectacular recipe for mead that could compete against the popular Honningbrew Mead, Rundi died at an unmarked altar, not having completed his task. This weapon was originally a quest item in the unused College of Winterhold quest, The Missing Apprentices. 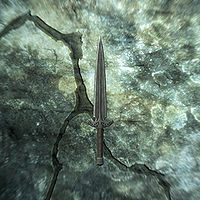 For each of the missing apprentices, an item that would be identified as belonging to them (such as this dagger) would be taken to Phinis Gestor, confirming their grim fate. Despite their quest not making it into the final game, the dagger and Rundi can still be found.